Few traditional foods are as beloved as bone broth. Slowly simmered, pleasing to all our senses, and renowned for its many benefits. 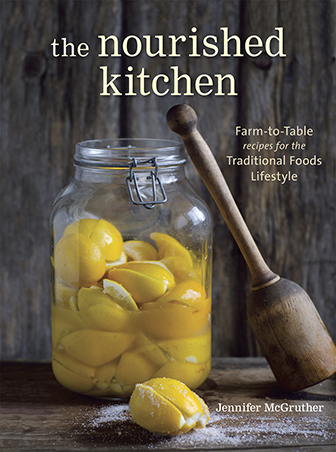 Making stocks and broths is often one of the first skills that those engaging traditional foods reclaim. Many people think that since it is made with bones, and bones contain lots of minerals, that bone broth would be a good source of calcium and other similar nutrients. In fact, there are many modern marketing angles aimed directly at touting the mineral and nutrient content of bone broth. Unfortunately, this couldn’t be further from the truth. Minerals and Nutrients in Bone Broth? Surprisingly, bone broth is a poor source of minerals and nutrients. Recent USDA figures found calcium ranges from 9 to 14 mg per cup of broth. For comparison, a cup of milk contains around 300 mg of calcium, or 30 times more than bone broth. Lawrence Dubois, from the health food store Salt Springs Natureworks, intrigued by all the claims about bone broth, performed his own independent tests using venison bones. The results? The venison broth had around 75 mg per liter or about 18 mg per cup which are some of the highest results seen but still only equivalent to a quarter of a cup of milk. He was so stunned by the results that he retested multiple times using different bones, cooking times, and more. And yet, he was consistently surprised to see such low mineral numbers. These results are not new or an anomaly. Back in 1934, King’s College Hospital did the original testing of bone broth. Their report (PDF) stated that the calcium content of several types of bone broth were 5.2 to 28.6 mg per 100 cc or 12.30 to 67.7 mg per cup. Their findings also point to an important observation about where the minerals in the highest test results originated. One interesting thing that all this testing revealed is just where certain nutrients in broth come from, and it isn’t from the bones. It is from the vegetables. Many of us remember our waste not, want not grandparents with garages and basements full of old bottles and jars. Drawers full of this and that, just in case, and leftover vegetable scraps – carrot tops, outer onion layers, celery tips, and the like – on the counter or in the fridge or freezer waiting to be tossed into the next batch of broth or stock. This traditional approach to broths and stocks, where these collected leftovers from vegetables were often saved to be tossed into the stewing pot of stock, show great wisdom. These vegetables not only add flavor and depth to this delicious food but they are one of the primary sources of minerals and other nutrients such as calcium. In the King’s College study, the stocks that had the highest tested mineral scores had the most vegetable matter. What does this mean? When making stock and bone broth, be sure to include your vegetable scraps if you want the most nutritional value for your efforts, or consume broths with added vegetables, as in soup. Not only does it add important flavor components but it allows you to turn vegetable waste into a nutritional win. Save your carrot tops and other vegetable scraps for the stock pot. Once done there, you can then send them on to the compost pile or animal feed. What are the benefits of bone broth then? If this traditional food has so little mineral value then why is it so revered? 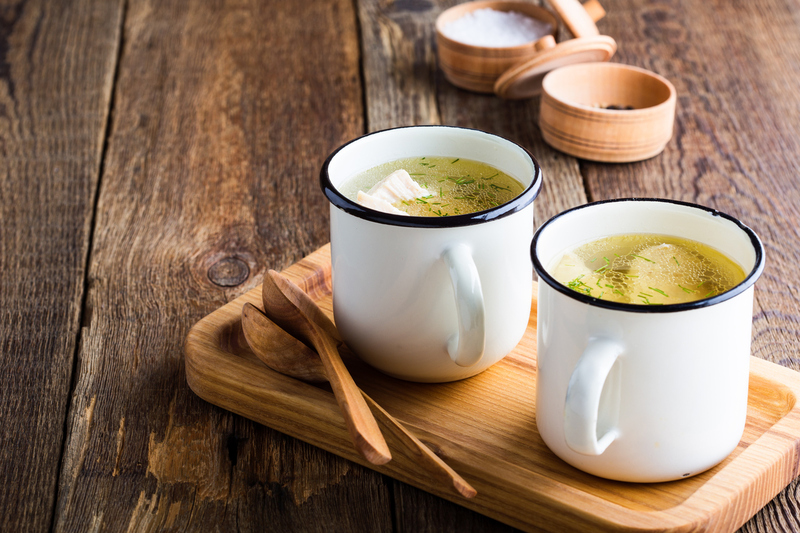 Long-simmered bone broths and stock does have a number of important nutritional and health benefits, it just isn’t in the minerals. The benefits are in the its protein profile and its impact on how our body digests the other parts of our meals. Modern American diets tend to have an imbalanced amino acid intake. The reliance on muscle meats almost exclusively, instead of engaging in “nose-to-tail” eating of the animals, results in an overabundance of some amino acids and a very little of others. This imbalance appears to have significant consequences for our health such as fertility and lifespan. Also, bones in animals and humans are only partially made up of minerals but a large percentage is collagen which is built from proteins. The two main proteins in collagen are glycine and proline, and a fair amount of glutamic acid which gives the foods made from bones their rich and savory flavor, as explained extensively in the cookbook Broth and Stock. This is in stark contrast to muscle meat, whose primary amino acid is methionine. Methionine can deplete your body’s glycine stores, among other problems it can contribute to when consumed in excess. And make no mistake, most modern American diets have an excess of methionine because of the over reliance on animal muscle meats and disregard and dislike for the other parts of the animal. Thus, bone broth plays a protective, nutritionally balancing role in modern muscle meat rich diets. It also contains a host of other beneficial compounds such as gelatin, chondroitin, and more that have known health benefits. Long-simmered bone broths and stocks are not really meant to be a food unto themselves, even though a nice warm mug of broth in the morning is a nice mix up from the usual fare. Rather, they serve a critical role in cuisine. They are the base, or foundation, for so many satisfying, easy to digest, and nutrient dense-dishes. What would chicken soup be without chicken stock? What would glazed short ribs be without demi-glace? Traditionally, bone broths and stocks served as a complement for meat and vegetable dishes, on its own as a companion to a dinner of meats, fish, pulses and vegetables, or blended together with these foods in soups and stews. It’s as part of these dishes that bone broths and stock truly shine, both nutritionally and culinarily, providing deep-rooted flavor and copious amounts of protein, much in the way of gelatin, as a partner to the ample vitamins and minerals provided by other foods. These latter benefits of stocks are historically and in other cultures well established but are debated by modern American dietary authorities. Regardless, broth has a long history of use in many cultures and the clichéd “Grandma’s Chicken Soup” which always soothed a cold is just one familiar example in a long, rich tradition of genuinely nourishing our families. 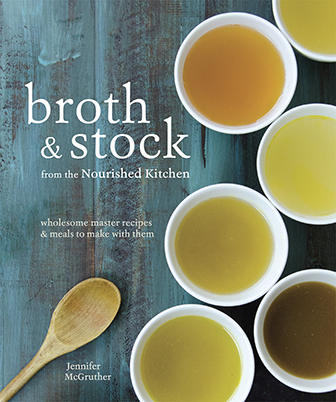 Pair bone broths with plenty of vegetables, and Broth and Stock is the essential cookbook for making bone broth and stock, plus gorgeous recipes for using broths that you make. These recipes pair gelatin-rich bone broths with vitamin- and mineral-rich vegetables for wholesome, delicious meals. Assemble the right tools for making bone broths. You’ll want a heavy stock pot for simmering your broth, a skimmer for removing the foamy scum that rises to the top of broth as it cooks, and a fine-mesh sieve for straining the broth once it’s done. If you don’t have time to make bone broth at home, you can purchase traditionally made, slow-simmered bone broth online here. It’s shelf-stable and great to keep on hand for times when you just don’t have broth handy. This is an excellent post. The inclusion of veggie scraps makes sense on every level and the use of bone broth as a foundation to other meal components supports the holistic philosophy of real food based nutrition! Even after my broth is strained, I see a gray sediment at the bottom. Looks like delicate flakes. Is it from bone marrow? I throw it out but maybe it has some benefits. Would you know what it might be? What do you think of Sally Fallon when she write in Nourishing Traditions “Acidic wine or vinegar added during cooking helps to draw minerals, particularly calcium, magnesium and potassion, into the broth”? That an acidic medium will draw out some trace minerals is true, but the idea that doing so makes broth a good source of minerals or in any way mineral-rich is false. I’m surprised to read about this too! I like veggies added to my broth and also some meat – to me it is much more flavorful. My question is that when one cooks the bones down to about half their original weight, where has all that material gone? It’s important to note that adding vegetables to your broth doesn’t make your broth particularly mineral-rich, either. It’ll contain marginally more minerals, but still not as much as, say, just eating your vegetables or drinking a cup of milk. The material that you’re referring precipitates out and kinda sinks to the bottom like a sludge of sort. That *will* have minerals, and I suppose you could increase the mineral density of your broth by keeping the precipitate, and whisking it into the broth every time you use it. But, it’s also NOT just minerals; rather, what comes off the bones is largely collagen that has been dissolved into the broth and makes it gelatinous. If I save my vegetable scraps in vinegar will that be good for the broth? You could add it and see how you like it. It still will not significantly increase the mineral content of your broth. From a culinary perspective, I don’t recommend adding vegetables to the stock pot, especially for long cooking as the nutritional benefits are marginal at best and doing so can introduce off flavors to your broth. That makes sense. I forgot about the long cooking tine. I haven’t added vegetables to my bone broth in the past, mostly because I want to preserve the flavor of the particular bones, and to save time and effort. I don’t have enough freezer space to store veggie scraps. I hate to waste them. I will try to make a veggie broth instead. I will rinse and strain the vegetables before I make the broth and add fresh vegetables as well. Will that be good? This is not for nutrition, just for flavor, and for a liquid in cooking. So maybe old veggies are not a good idea in veggie broth. I am not able to compost. Oh well. Thanks! I love you site. love your ideas. Your book started me on a wonderful path. The cover is a favorite. I’m curious whether the stock studied was made with vinegar added to the water, which would help dissolve the minerals, or whether it was cooked in straight water. It would be interesting to see a study done comparing the two methods, or how much vinegar for what type of bones. My recipes for Chicken stock call for less vinegar than beef, I assume because of the difference in thickness of the bones. Yes, the Salt Springs test was made using stock with vinegar, and, no, it didn’t create a mineral-rich broth. Broth has a high water content and a high protein content but it doesn’t contain a high mineral content, even if you use ACV or vegetables you’ll only increase the content marginally. This is because the minerals aren’t suspended within the broth. Better to eat broth with other mineral-rich foods. Have you ever made bone broth in a pressure cooker? If so, would you recommend it? Would you get the same results? That’s my preferred method now! I’m so glad you looked into this for us! Love your book, and I love to read the real research even more. I would be curious to know if adding vinegar to the broth helps pull out the minerals as it is claimed to. I stopped doing that a while back because it keeps me from being able to cook beans (they stay tough unless I add a bunch of baking soda) in the broth. Your cook book broths and stocks has changed my life… for the better!! The recipes are so simple and delicious. And I’ve never felt better. It’s been a true treat knowing I can prepare delicious healthy meals for myself and our little family. Thank you ever so much! Thank you so much for your warm and positive comment! I know this is kind of nit picking, but did they analyze the broth for other minerals or vitamins, besides just calcium? Or did I miss that in the article somewhere? I had read somewhere that broths and stocks contained decent levels of magnesium and potassium, but I remember not seeing any evidence to back that up. Thanks! Broths and stocks aren’t mineral-rich, not in calcium, nor magnesium. You can click through and read the study and the full mineral analysis as well as the conclusion by the researchers.